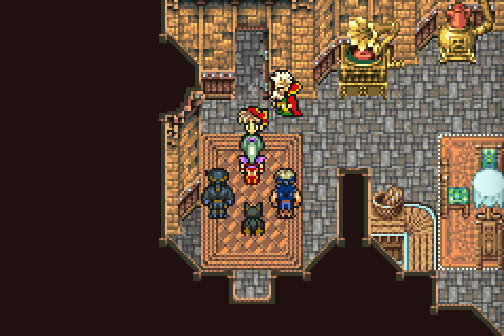 Final Fantasy VI copyright Square Enix. 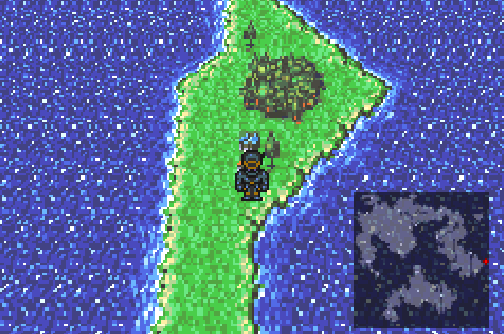 - Upon landing at the new continent you’ll have a team consisting of Terra, Locke, and Shadow. You should probably spend a bit of time teaching Shadow spells - he probably won’t have any, and though he doesn’t stick around for long at the moment he plays a large part in a major dungeon rather soon. The enemies in this part of the world are tough against physical attacks, but the Throw command and second tier magic should make short work of most beasties with little trouble. - Head northeast from the shoreline and you’ll wind up in Thamasa. Now that you’ve ‘officially’ arrived the merchants will sell you weapons, armour and items, the best you’ll find in the first half of the game. Don’t bother stocking up for everyone right now, though - just purchase enough equipment for Terra, Locke, and Shadow. - Poke around town. There are Eye Drops hidden in one of the barrels beside the item shop,a Gold Needle in a barrel beside the relic shop, a Green Cherry in a barrel beside a house to the north, and an Echo Screen in a barrel beside the house through the fence to the north. In your travels you’ll also discover that these people are a little shifty. - The innkeeper currently charges you 1,500 gil a night to stay. Ouch. That will change shortly - but if you want to grind out levels for Shadow, you’ll either have to do that or shell out for Tents to restore everyone’s health. Your call. - Once you’re done levelling, have a look at the northeast-ish house in town. An old man inside, default name of Strago, will engage your party in chatter - and he’ll soon be joined by his granddaughter, default name Relm. They’re… suspicious. - … and then prepare for a late-night intrusion as Strago bursts in, demanding help. Speak to him outside to learn that, yeah, these people are hiding something, then rush into the burning building that threatens to take down the rest of Thamasa with it. - Because logic dictates as much, you’ve entered a house that’s on fire. Smooth. Shadow has left your party, but he’s replaced by Strago. Strago doesn’t know any conventional magic as of yet, but he possesses the Lore ability, which allows him to learn magic used on him by monsters in battle. Even if Strago dies you’ll still learn a Lore so long as you won the fight. In his current repertoire is Aqua Breath, an all-hitting water attack that is quite useful on the enemies in the Burning Home. - On the second screen you’ll encounter Balloons, the Home’s sole enemy, as roving fireballs on the map. You can avoid them if you wish, but they’re really easy to kill with a Blizzara from Terra or a single use of Aqua Breath. Equipping an Icebrand or an Ice Rod for your physical attacks will also typically kill these things in one hit. - There are two doors in the next hallway. The left leads to endless battles against Balloons, as they’ll keep popping out and surrounding you. You’ll always be caught in a pincer attack, so this isn’t the best place to grind if that’s your desire. The right door leads to another hallway with two more doors; take the right to find a Flame Rod (so helpful in here) or the left to continue to another hallway. - Hey, look! Two more doors! Brilliant. 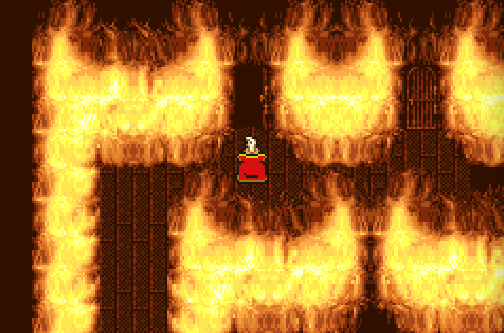 The right leads to an Ice Rod, which is a good weapon for Strago if you don’t already have one, while the left leads to the source of the blaze. Boss battle ensues. This battle is less obvious than it looks. Flame Eater attacks rather predictably, employing a variety of fire-based attacks to dish out some serious damage. This can get especially bad if it uses high-tier fire magic on a single character rather than spreading it out to everyone in your party. At first wiping out Flame Eater with ice magic seems the natural path, and it does work rather well, only Flame Eater will respond by casting Reflect on itself to send your magic back at you. You can get around this by casting Reflect on one of your own party members and bouncing magic off of them, but Flame Eater’s propensity for summoning Balloons and the occasional Grenade make this a chancy proposition at best. The best way to plow through this fight is to equip one of your fighters, probably Terra, with a Genji Glove and two Icebrands. With Terra in Trance and dual wielding she’ll deal terrific amounts of damage to anyone she targets, and if Strago uses Aqua Breath to clear out the Balloons she’ll be targeting Flame Eater most of the time. Smack away at it until it goes down. You can alternatively have Terra go Trance and use an Ice Rod as a weapon on the thing, which has a good chance of killing it in a single hit. Booyah. 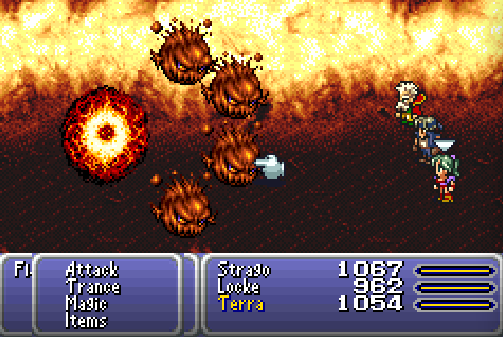 Just try and end this battle quickly, as Flame Eater is pretty danged good at wearing your party down. - The death of the Flame Eater will spark a cut scene, you’ll be saved from the Burning Home, and, eventually, you’ll be set on a new course towards the Espers - one a short journey to the west.